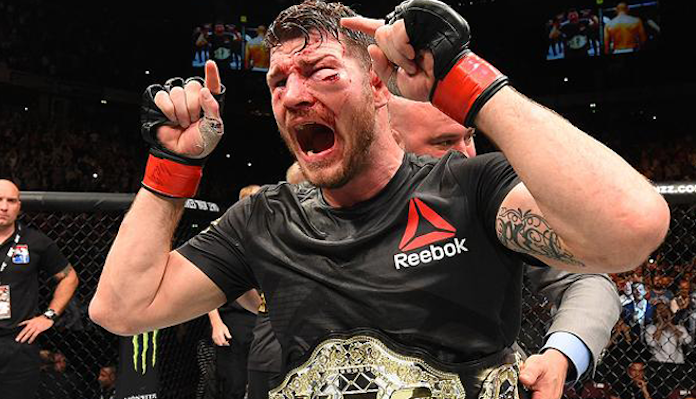 On Saturday night, during the main card of the action-packed UFC London card, it was announced that former UFC middleweight champion Michael Bisping will be inducted into the UFC Hall of Fame. Speaking on Instagram shortly after this announcement was made, the English MMA legend issued a quick statement about this profound honor, thanking his friends and family for their support. Thank you to every Theo has supported me over the years. My wife and children, everybody in the Uk, my coaches,the ufc and many many more. Keeping it short as I’m supposed to be working the fight here. Much love to you all. Michael Bisping entered the MMA limelight when he won season 3 of The Ultimate Fighter. During the course of his legendary MMA career, he defeated big names and fellow legends like Matt Hamill, Chris Leben, Denis Kang, Dan Miller, Yoshihiro Akiyama, Jorge Rivera, Jason “Mayhem” Miller, Brian Stann, Alan Belcher, Cung Le, CB Dollaway, Thales Leites, Anderson Silva, Luke Rockhold and Dan Henderson. His victory over Rockhold, which came by way of first round knockout, marked the beginning of his late-career title reign, while his victory over Henderson marked his lone defense of the belt. Michael Bisping retired last year, with an overall record of 30-9 overall.